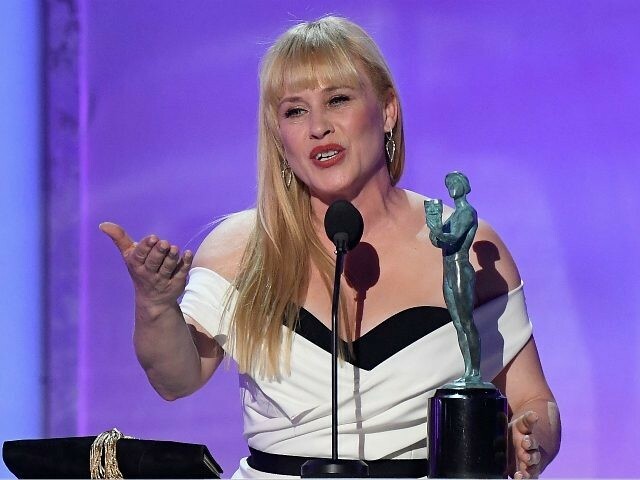 Actress Patricia Arquette took the stage Sunday night at the 25th annual Screen Actor’s Guild Award and gave a shout out to special counsel Robert Mueller. “Thank you, Robert Mueller and everyone working to make sure we have sovereignty for the United States of America!” Patricia Arquette shouted to the star-studded audience at the Shrine Auditorium and Expo Hall, Los Angeles, CA, while accepting the award for Actor for Outstanding Performance by a Female Actor in a TV Movie or Miniseries for her performance in the Showtime drama Escape at Dannemora. Indeed, like many other Hollywood figures, the former CSI: Cyber star has become increasingly politically outspoken since the election of Donald Trump. It’s also not Arquette’s first time injecting politics into her acceptance speech from the awards stage. In 2015, at the 87th Academy Awards Arquette called for “equal right for women” in America.